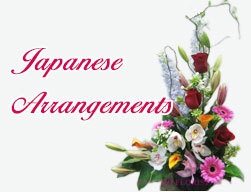 JAPA008 Japanese Arrangement in the quality ceramic bowl [JAPA008] - $250.00 : Hanamo Florist Online Store, Vancouver, BC, Canada, Quality arrangements using a plethora of the freshest flowers. Suited for the party table centre, the resistration desk, gift, and more. The flower colour can be up to your choice, but please call Hanamo Florist to confirm .